Kangaroos and wallabies are pouched mammals, or marsupials, of Australia and nearby islands that are famous for their great leaping ability. The name kangaroo is usually used for large species and wallaby for smaller ones. They all belong to the family Macropodidae , meaning "big footed," and they are mainly herbivorous, or plant-eating. Most members of the family are nocturnal, feeding at night. Some live on the ground and some in trees. The largest kangaroo is the male red kangaroo, whose head and body can grow up to 6 feet (almost 2 meters) tall and tail to about 3.5 feet (1 meter) long. It can weigh 200 pounds (90 kilograms). The two hind legs of kangaroos and wallabies are enlarged for leaping. The hind feet have four toes: two tiny ones used for grooming; a third, huge toe with a strong, sharp claw that can be used as a weapon; and another small toe. 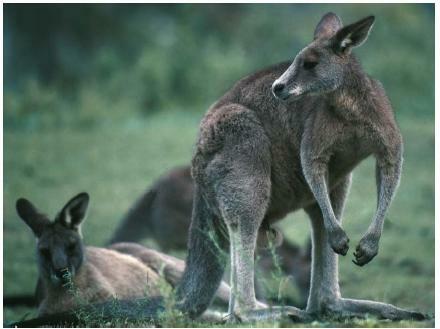 The kangaroo's two hands have five clawed fingers, all approximately the same length, used for grasping. Kangaroos are often called "living pogo sticks"; indeed, the grey kangaroo has been known to jump up to 30 feet (over 9 meters) long and 6 feet (almost 2 meters) high. Because the springlike tendons in their hind legs store energy for leaps, it has been calculated that kangaroos actually use less energy hopping than a horse uses in running. A kangaroo tends to move in a leisurely fashion using all four feet plus its hefty tail for balance. Most are unable to walk moving their hind legs at separate times. They move their hind legs while balancing on the front legs and tail, then move the front legs while balancing on the hind legs, rather like a person walking on crutches. Tree-dwelling kangaroos do have the ability to move their hind legs at different times as they move among the branches. Some kangaroos live in social groups and others are completely solitary. In general, the larger animals and the ones that live in open grasslands are more social. Within a group, called a mob, the individuals are safer. In a mob, the dominant male competes with the others to become the father of most of the offspring, called joeys. Because the dominant male is generally larger than the other males (called boomers), over many generations the males have become considerably larger than the females (called does). For such a large animal, the gestation period (pregnancy) is incredibly short. The longest among the kangaroos is that of the eastern gray. The baby is born after only 38 days. It is less than an inch long, blind, and hairless like the newborns of all marsupials. The kangaroo has virtually no hind legs at all when born. In fact, the front legs, which are clawed, look as if they are going to be mammoth. However, these relatively powerful front paws serve only the purpose of pulling the tiny unformed creature through its mother's fur and into her pouch, where her teats are located. (Like all marsupials, female kangaroos have a protective flap of fur-covered skin that shields the offspring as they suckle on teats. The kangaroo's marsupium, as this flap is called, is a full pouch that opens toward the head.) Once the baby's tiny mouth clamps onto a teat, the teat swells into the mouth so that the infant cannot release it. The baby, now called a pouch embryo, cannot let go even if it wants to. It will be a month or more before its jaw develops enough to open. The pouch embryo will continue to develop as it would if it were inside a uterus (womb). Most of the big kangaroos will spend 10 months or more before the joey emerges for the first time (often falling out by accident). It gradually stays out for longer and longer periods, staying by its mother's side until it is about 18 months old. A male great kangaroo reaches sexual maturity at about two or three years, a female not for several years more. One fossil kangaroo, Procoptodon goliah, was at least 10 feet (3 meters) tall and weighed about 500 pounds (227 kilograms). Today, the largest of the species is the male red kangaroo, which may have a head-and-body height of almost 6 feet (1.8 meters) with a tail about 3.5 feet (1 meter) long. It may weigh 200 pounds (90 kilograms). Fourteen species of living kangaroos belong to the genus Macropus. Some of them are the largest marsupials. They have been regarded both as pests and as among the treasures of Australia. Farmers have long argued that they take food from sheep and cattle, but actually kangaroos select different grasses from the domestic livestock. Today, only a few are seen near urban areas, but they are widespread in the countryside, where they are still a favorite target of hunters, who sell their skins. The eastern gray kangaroo and its western relative—which is actually brown in color—occupy the forest areas throughout the eastern half and the southwest region of the continent. In the continental interior, the red kangaroo lives in open dry land, while wallaroos, also called euros, live around rock outcroppings. The wallaroos, which have longer and shaggier hair than the larger kangaroos, are adapted for surviving with minimal water for nourishment. When water is not available, the animal reduces the body's need for it by hiding in cool rock shelters and their urinary systems concentrate the urine so that little liquid is lost. Smaller kangaroos are usually called wallabies. The name is especially used for any kangaroo with a hind foot less than 10 inches (25 centimeters) long. The two smallest are the tammar wallaby of southwestern Australia and adjacent islands and the parma wallaby of New South Wales. Their heads and bodies are about 20 inches (50 centimeters) long with tails slightly longer. The tammar wallaby has been known to drink salt water. The whiptail wallaby is the most social of all marsupials. It lives in mobs of up to 50 individuals, and several mobs may occupy the same territory, making up an even bigger population. Rock wallabies have soft fur that is usually colored to blend in with the dry, rocky surroundings in which they live. However, the yellow-footed rock wallaby is a colorful gray with a white strip on its face, yellow on its ears, dark down its back, yellow legs, and a ringed yellow-and-brown tail. Rock wallabies have thinner tails than other wallabies and use them only for balance, not for propping themselves up. They are very agile moving among the rocks. Some have been known to leap straight up a rock face 13 feet (4 meters) or more. Rock wallabies have sometimes been let loose in zoos, where they live and breed in communal groups. Several wallabies that were widespread in the past are probably already extinct. Called nail-tailed wallabies, they have tough, horny tips to their tails. These 2-foot-high (60-centimeter) marsupials lost their habitat to grazing livestock and farms. Nail-tails have been called "organ grinders" because their forearms rotate while they are hopping. The tree kangaroos live in trees high on the mountainsides of New Guinea and Australia. They have fairly long fur and live in small groups. Some of them have the ability to leap between strong branches of trees as much as 30 feet (9 meters) apart. Tree kangaroos have longer forearms and longer tails than land-dwelling kangaroos. Although their tails are not truly prehensile, or grasping, they may wrap themselves around a branch to help support them. Unlike other kangaroos, their tails are the same thickness from base to tip. Tree kangaroos are often hunted and so are decreasing in numbers. This decrease is augmented by the fact that the single young stays in the pouch for almost a year and suckles even longer. A subfamily of smaller, more primitive marsupials are called ratkangaroos. These animals tend to be omnivorous, eating a variety of foods. The musky rat-kangaroo is the smallest member of the kangaroo family, with a head-body length of only about 10 inches (25 centimeters) high plus a furless tail (the only one in the family) about 5 inches (12 centimeters) long. This species also has front and hind feet closer to the same size than any other member of the family. It eats some insects along with its grasses. The bettong, also called the woylie or brush-tailed rat-kangaroo, has a prehensile tail, which it uses to carry the dry grasses used in building a nest. Woylies were quite common over southern Australia, but as human populations have increased, it has become extinct in most of its range. Similarly threatened is the boodie or short-nosed rat-kangaroo. The only kangaroo that digs burrows, in which it gathers in a family group, it is now restricted to several islands in western Australia's Shark Bay. Unlike the other members of the kangaroo family, the boodie never uses its front feet while walking. Clearly, many of the smaller members of the kangaroo are threatened or even nearing extinction. Apparently, they are more vulnerable to even the smallest changes in their habitats. The great kangaroos, on the other hand, appear to be thriving as long as their habitats remain protected and hunting for their skins is kept at a minimum. I would like to say it was a very good article but I could not find how big a new born kangaroo is. this is the best thing on kangaroos! bye! and miranda if you read this a baby kangaroo is about the size of a jelly bean! This is spectacular thank you very much this helped me alot with my science animal research project. This was good information but i did not find out at what age they reach sexual and physical maturity. How does the wallaby and kangaroo fight for food, shelter, and water?